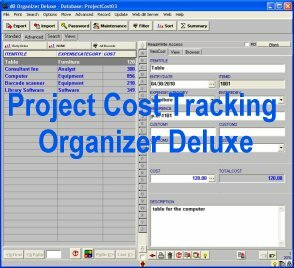 Project Cost Tracking for Windows: simple database management software that helps you to create and manage your project costs. Includes several simple project cost tracking database templates to choose from. Very fast and easy data entry. Print, display project cost summary reports. Manage planned and actual costs. Print, display project cost summary reports, project cost lists.. Simple, high-level resource and project scheduling with project and resource forecasting and flexible calendar views.